RedLaser let you compare prices by scanning barcodes. NeoReader: Free, with in-app purchases. Download at the App Store. 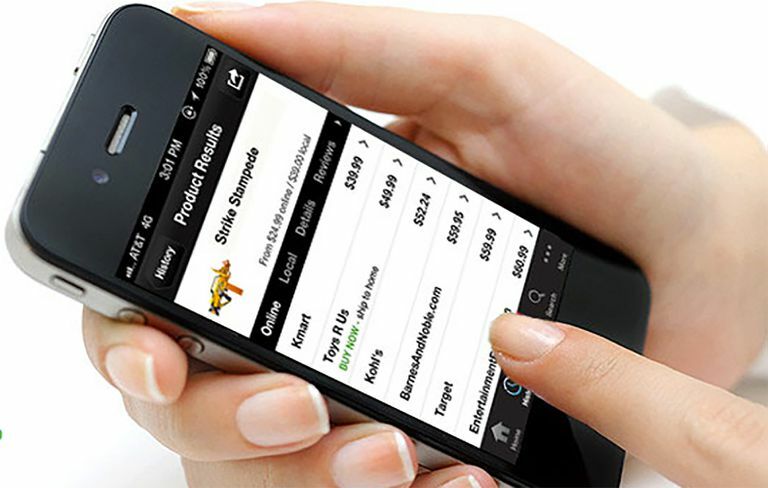 RedLaser is one of the most popular free iPhone shopping apps. And with good reason: it's going to help you save money. With it, you can find out where to get the best price on a product — either online or at retail — just by scanning a barcode. I'm not the only one who likes it. Just check out the App Store, where the app has an average 4.5-star rating from more than 850 reviewers. After testing RedLaser, I can see why it enjoys such high ratings — it’s an intuitive and simple barcode scanner app that works incredibly well. The RedLaser app is designed to help you compare prices on any number of items by scanning a barcode with the iPhone’s camera. To start scanning items, tap the small lightning bolt icon on the bottom of the app and line up the barcode within the onscreen arrows provided by the app. When the arrows turn green, you've got the barcode properly positioned. You’ll see a "hold still for scan" message while the app does its magic. After the scan is complete, results pop up in one or two seconds. I was super impressed with how quickly the RedLaser app posted its results. Unlike some other price-comparison apps I’ve reviewed, including the Shop.com app, RedLaser’s results pages are well organized. The app displays both online and local prices for the item you scanned, and you can toggle between the two screens of results (particularly helpful if you need the item right now and can't wait for it to be shipped to you). Prices are displayed in large green numbers, and it’s easy to see how prices compare at a glance. Each price comes with a link to that store’s website, but whether those pages are optimized for the iPhone or not is dependent on the store, which can lead to some awkward experiences. RedLaser also includes a nifty feature where you can email your scanned items to view later. The RedLaser scanner works remarkably well. The quality of barcode scanning apps generally comes down to two things: how well the scanner works and how quickly results appear. As noted earlier, results are fast. The scanner is great, too. The RedLaser scanner seems less vulnerable to movement than other shopping apps I've tested, so you don’t have to hold your hand quite as steady. I scanned dozens of items — everything from vodka to store-brand multivitamins — and the RedLaser app found a match every time. The scanner isn't perfect: it did have a harder time with glare on shiny or round objects, but you always can enter the UPC code by hand for hard-to-scan items. RedLaser is ​a great app to take along on your next shopping trip. The scanner does struggle a bit with glare, but that’s a problem you’ll encounter with any iPhone shopping app. The RedLaser scanner is faster than most apps, and the price results are displayed in an organized fashion that makes it easy to compare prices. The inclusion of local prices in addition to online results is also a plus. Overall rating: 4.5 stars out of 5. The RedLaser app works with the iPhone and the fourth-generation iPod touch. It requires iPhone OS 4.0 or later. RedLaser is no longer available. It was shut down by its parent company, eBay, in Dec. 2015. This review refers to an early version of the app, made available in late 2010.